With the start of school just around the corner, that means Christmas (and the many to-do lists that accompany the crazy holiday season) is not far off either. I know, I know – “bite your tongue, Kerri!”. But – I have a VERY special offer for all of you! Let me help you tackle one of the biggest chores of the holiday season…getting the PERFECT family picture for the yearly holiday cards!! 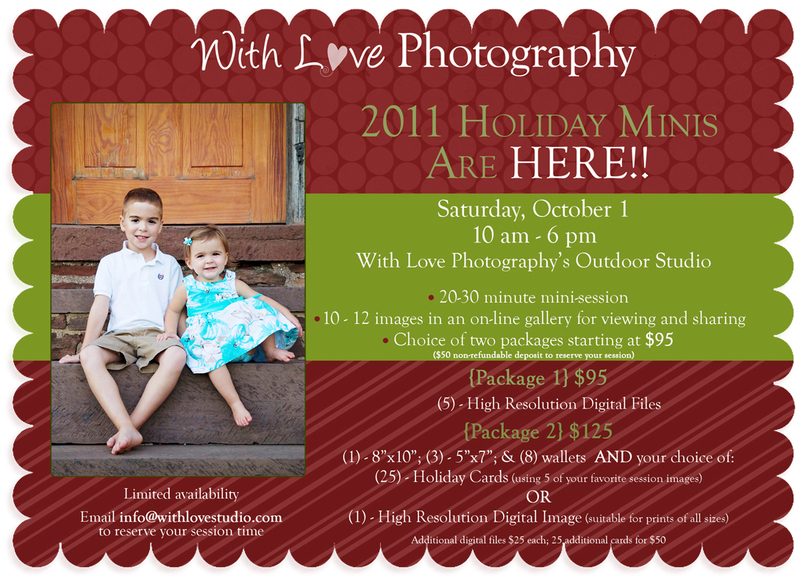 This October, I will be holding my very first Mini-Sessions. Mini-Sessions are just that -short sessions, lasting 20-30 minutes. These sessions are perfect for updating your family’s photos for the all important, yearly holiday card and also perfect for gift giving to the moms and grandmothers in the family! In just 30 short minutes, you could potentially check MANY items off of that unwieldy checklist! These sessions will be held on Saturday, October 1, on the grounds of my home studio. Knowing that some clients prefer digital images, while others prefer prints and/or holiday cards, I will be offering two packages to give you ALL what you want! Aren’t I nice? 😉 Consider this my early Christmas give to you! Your choice of 5 digital images (with full reproduction rights) or a package including 5 gift prints AND 25 cards featuring your favorite session images! At such a great value – these sessions are sure to book up quickly. Contact me soon to reserve your session.